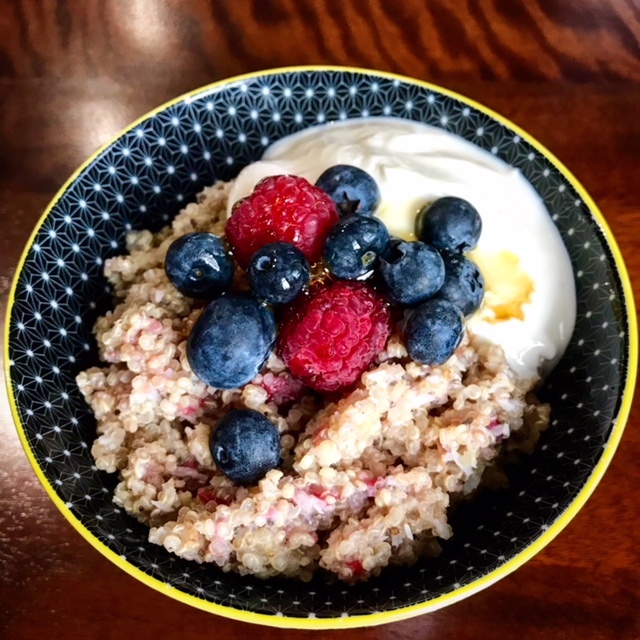 According to many sources, quinoa stands out for its nutrient density; it is naturally high in protein containing plentiful amounts of amino acids (the building blocks of protein); high in fibre and a good source of minerals and vitamins (particularly folate). So if you want to get a good start to your mornings, this is it! Wash your quinoa, drain and pop in a pan. Cut the vanilla pod in half and scrape the vanilla into the pan – you could use a good vanilla extract here instead. Add the almond milk, coconut cream, and maple syrup to the pan and pop on a medium heat. Bring to the boil and then turn down and simmer for 10 mins with the lid on. At this point I leave it overnight to absorb the remaining liquid. But if you are doing it in one stage, simply turn it right down and leave for another 5 minutes (make sure it doesn’t burn on the bottom, if you are worried, turn it off and leave the lid on). Portion it up, popping the remainder in the fridge. Place your portion in a pan with a dash more almond milk and heat through. 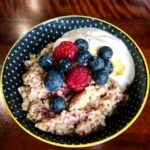 At this point I add the chia and the desiccated coconut, and I also drop in a few raspberries and crush them through the mixture. Once heated serve with berries and a little natural yoghurt. That sounds pretty delish and a nice change from oats!